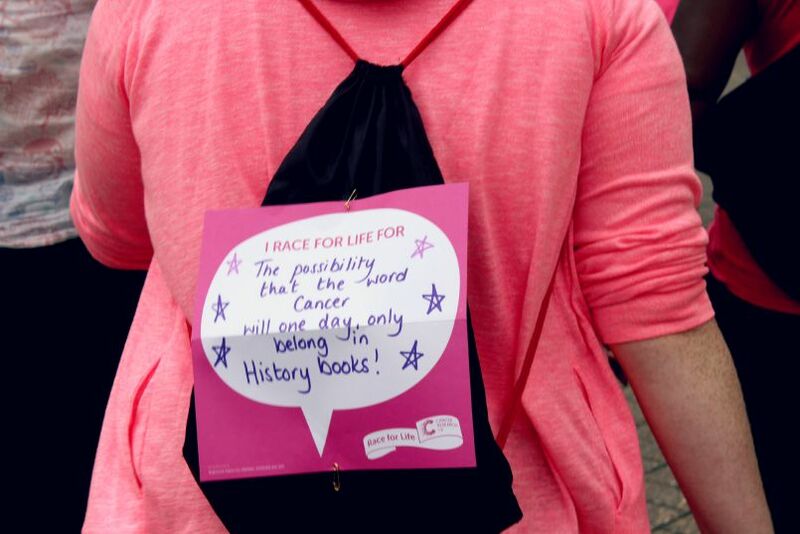 I have been aware of Race for Life for a long time now. I have had friends and family members who have taken part, but I had never done so myself. 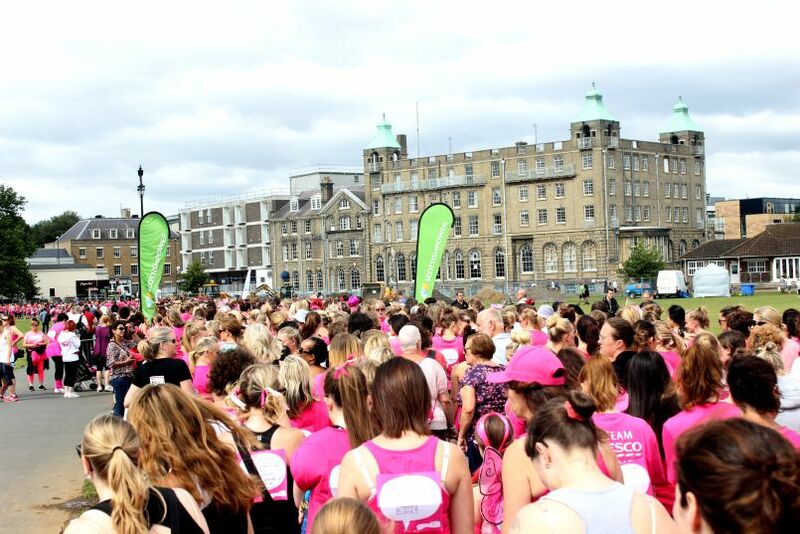 Scottish Power got in touch with me a few months ago, asking if I would like to run the 5k Race for Life in Cambridge. I was very lucky that they paid for me and my best friend to enter the race, and also paid for our travel and accommodation so we didn't have to drive all the way there the morning of the race. On Saturday I picked up my best friend and we headed on our two and a half mile journey to Huntingdon. We'd managed to find a hotel bargain and had access to their gym and swimming pool so we packed the correct attire and left towards lunchtime so we could fit some exercise time in. Luckily our room was ready when we arrived so we took our bags up, I threw Christine's retro-style bracelet gift at her whilst she waited for me to stop faffing, then when got ready and hit the gym.After an hour in there, and around an hour in the swimming pool we headed back to our room to shower (separately!!) and get ready for dinner.With wifi not working, I sat with a coffee and coloured in some of my Mindfulness colouring book whilst I waited for Christine to finish her turn in the shower. We had a wonderful meal at Pizza Express that evening and then when we got back to the hotel we grabbed a drink from the bar, took it back to our room and watched The Watch on Channel 4, then slept. It was really warm and air con was a bit pants so we didn't have the best sleep ever, however we woke up to a sunny day and had a lovely breakfast before we hit the road to make our way into Cambridge City Centre. Finding a park and ride was pretty tricky. Google wasn't too clear but we did find a postcode of one which we then ignored and instead headed to the Milton Park and Ride after following signs. This was really easy to find, and was perfect for when we were leaving to head home after the race. As we got on the coach we panicked as we looked at the time. Our race was supposed to start at 11, we had already missed the warm up and the general atmosphere before the race and we didn't then want to miss the start of the race too! We got there just in time, and as we snuck under the tape and cut across the course we then heard the runners start. We had a quick toilet break (essential when you are excersiing and have had children) and then had a look around. As I looked at the back of peoples tshirts I became emotional. I saw a photo of a really pretty young woman, she can't have been much younger than me. 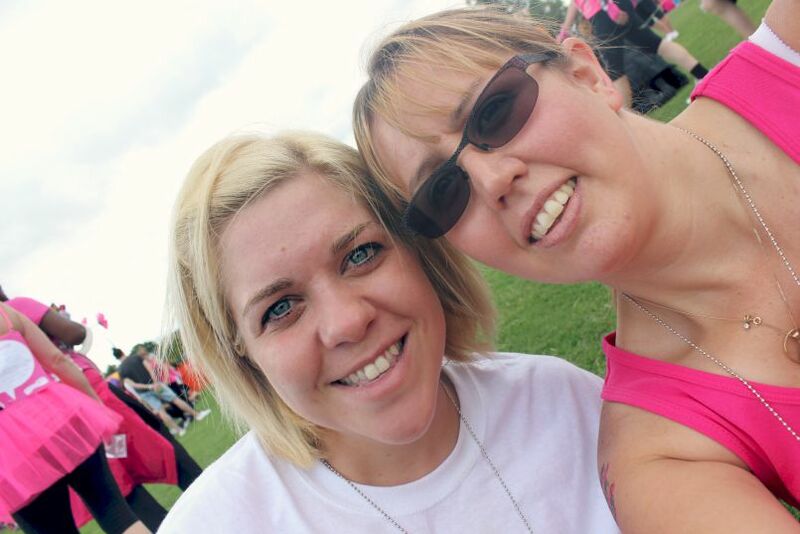 And there stood her sister and mum with tshirts on in tribute to her. It was really emotional and an eye opener as to why we were there, and why events and awareness like this are so important. We decided to go in with the walkers, however we ended up pretty much overtaking most of them and catching up with/being amongst the joggers in the end. 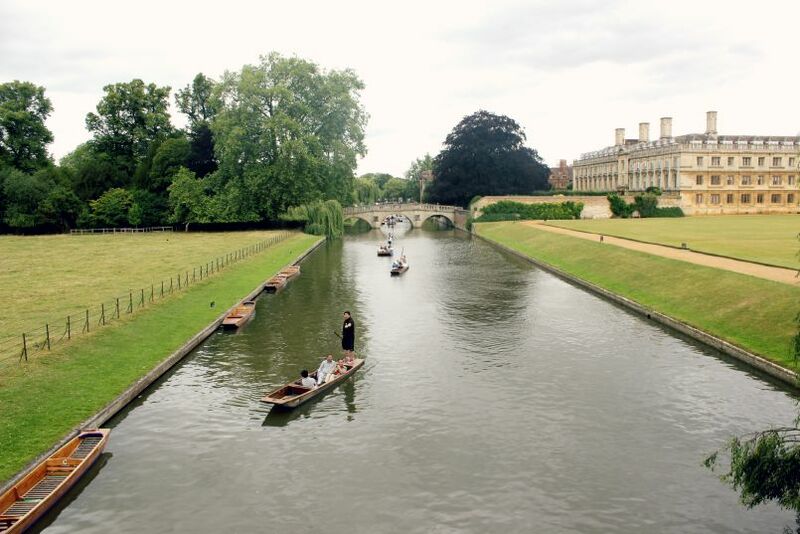 One of the best things about the race was not only raising money for such a good course, but also getting to see a lot of Cambridge City. The buildings were beautiful, it was just a shame that some shoppers had a total lack of respect and kept walking in the way of Race for Life participants to get to the other side of the street. As we went round I had a constant stitch, it was really painful and as much as Christine kept telling me to stop and have a break I wanted to battle on. I felt that if I stopped I would have failed, not failed for anyone else but failed myself. I didn't want to stop. 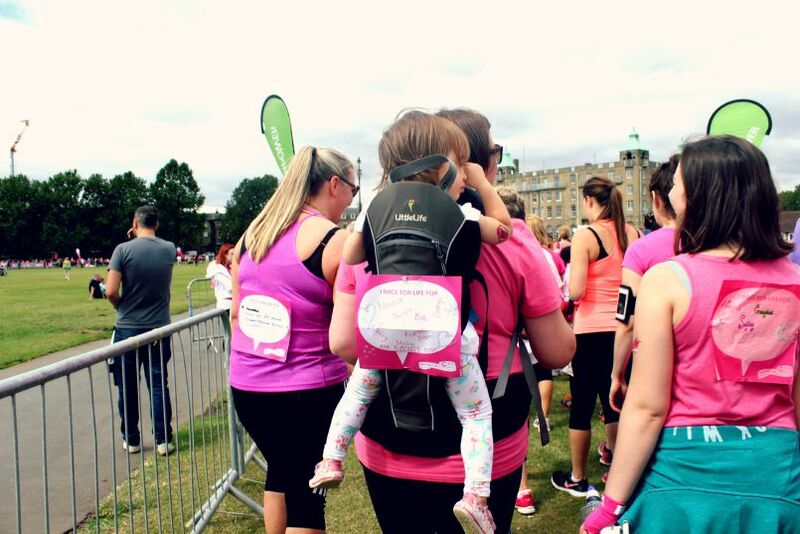 People go through worse than a stitch and I could walk 5k. As we neared the finish line I kind of wished it was longer. I was having such a lovely time, and felt so proud of myself and my friend. 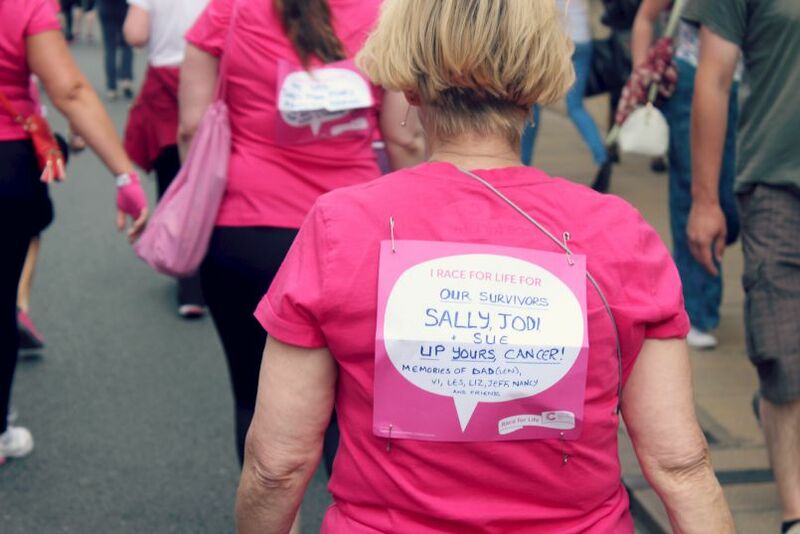 Despite it being sad seeing the things written on the paper pinned to everyone's backs, it was also so wonderful to see so many people walking for someone. For showing them their support and for fighting cancer in any form they can. 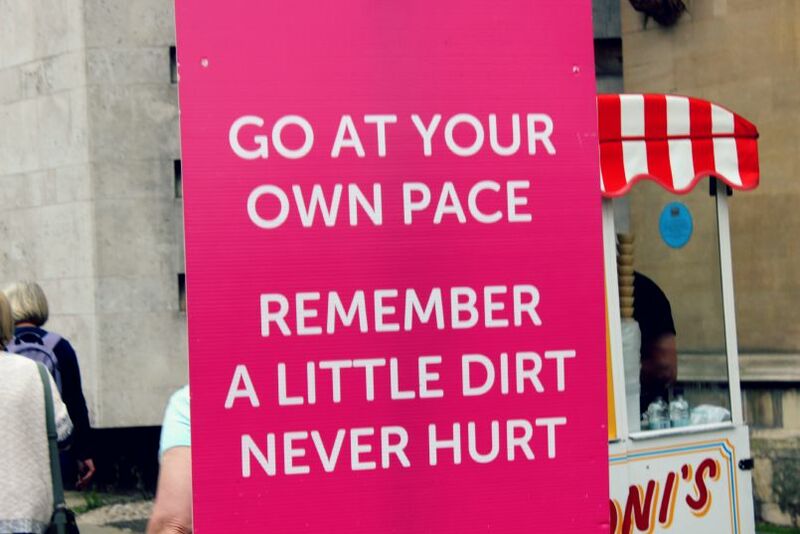 We decided to run the last part of the course and as we high fived the Heart team as we crossed over I felt a huge surge of pride and emotion....and dehydration. We were handed our medals, a brioche, bottle of water and a yogurt and then found an empty space on the grass to collapse sit down and catch our breath and thoughts. 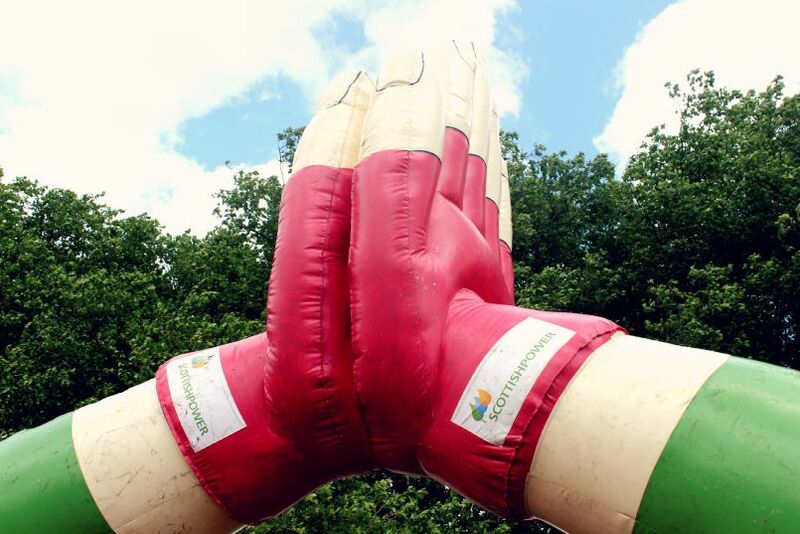 We then popped over to the Scottish Power tent (which we did mistake for a bouncy castle from a distance...awkward!) 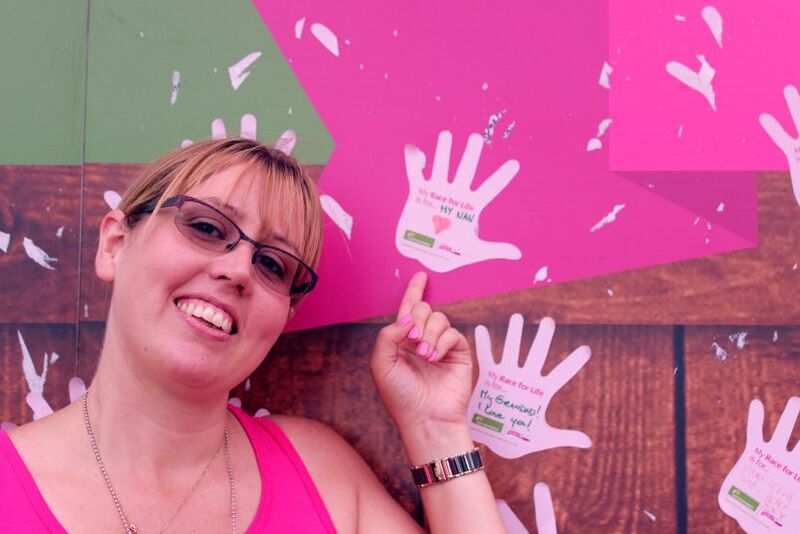 to take part in the Scottish Power High Five campaign. 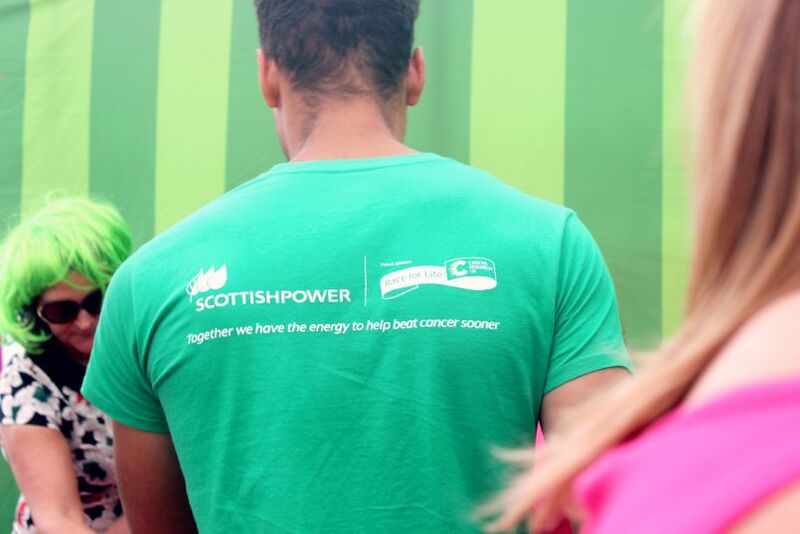 Why is ScottishPower working with a charity, and why Cancer Research UK? At ScottishPower we believe we have a responsibility to our customers and to our environment. We want to make a difference wherever we can. One in two people in the UK will develop some form of cancer in their lifetime1 and it is an issue that affects many of our customers and employees. 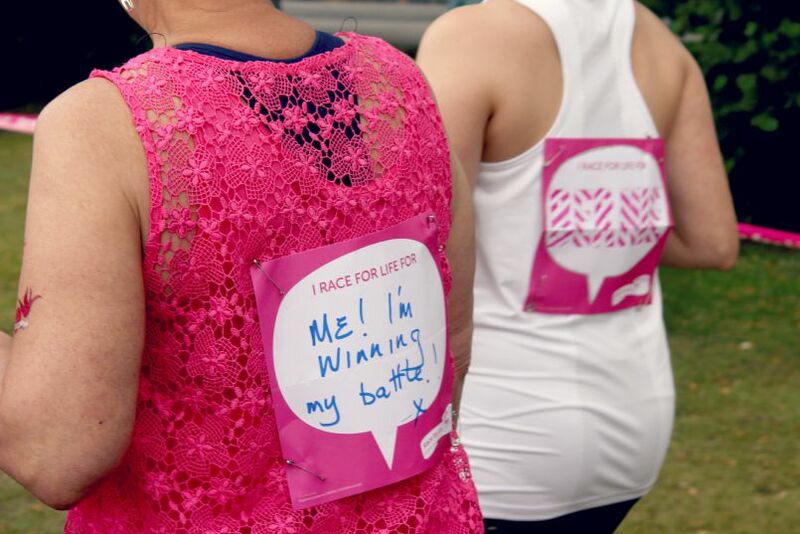 In 2012 we started a 3 year long relationship with Cancer Research UK with the aim of raising £5m. Since then we have raised in excess of £6m2 and we're not stopping there. 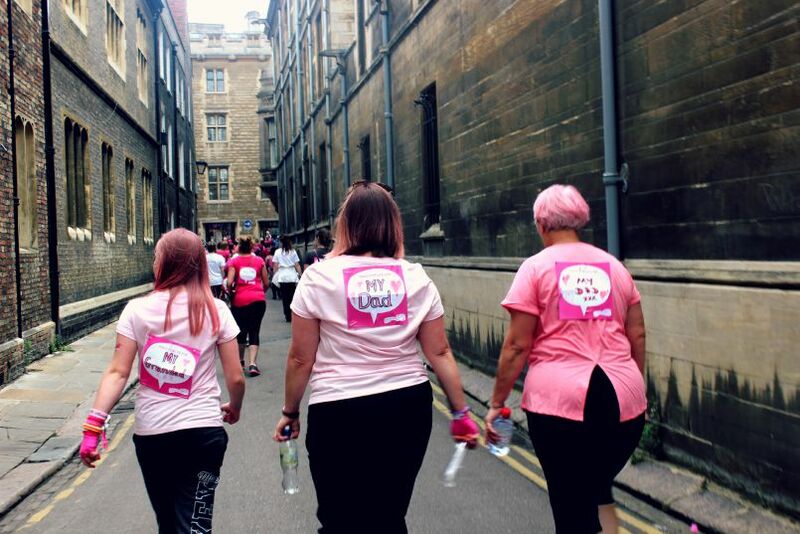 In April 2015, we renewed our relationship with Cancer Research UK for a further 3 years and we will continue to help generate funds for the charity through a range of activities. What is the High 5 Wave? 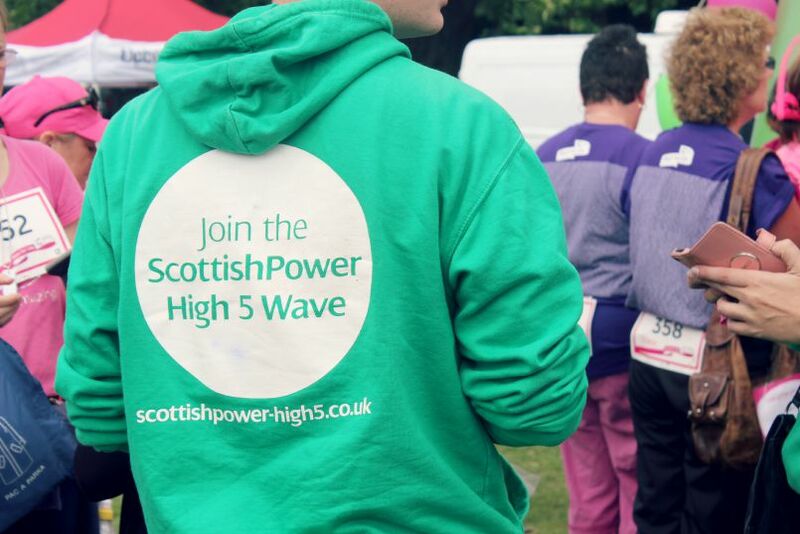 The ScottishPower High 5 Wave is a fun way for you to get involved and help us raise awareness and money for Cancer Research UK. High fives are a symbol of achievement and celebration for all of us every day. We want to use high fives to generate positive energy in the fight against cancer, so we're asking you to join in by generating high fives (including virtual ones online) and adding to our High 5 Wave along the way. 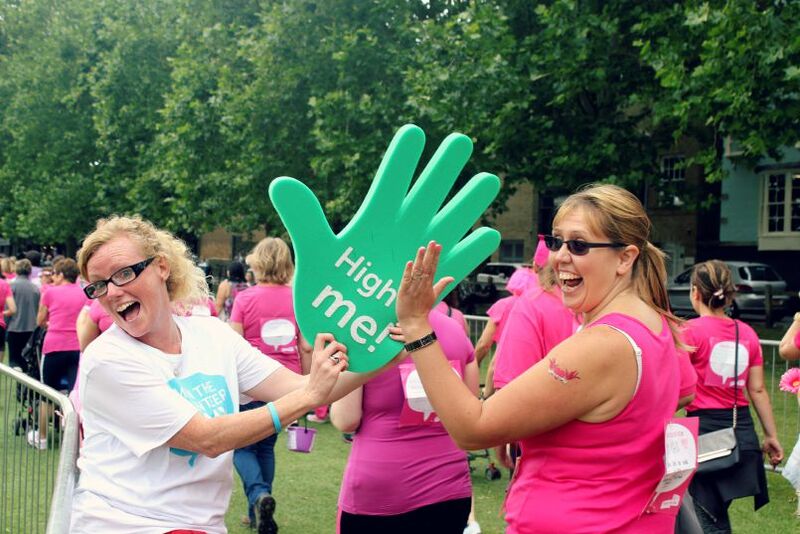 We're aiming to achieve 60,000 high fives, which we'll convert to £35,000 for Cancer Research UK5. 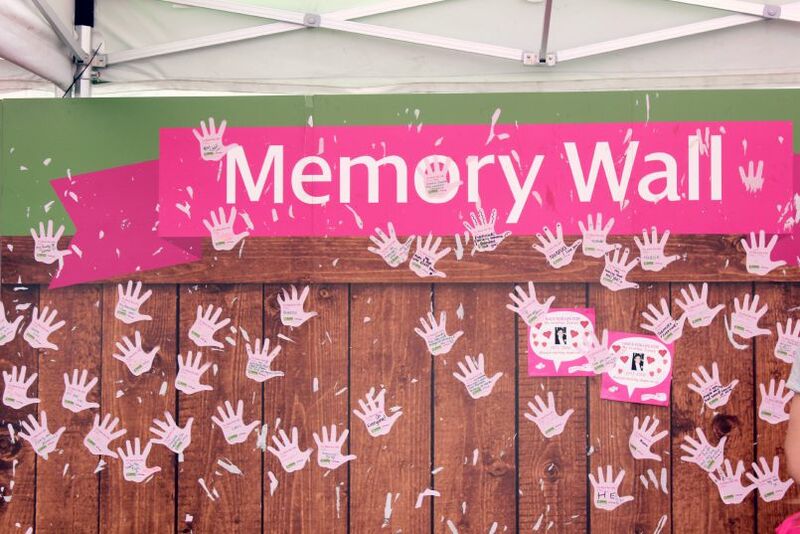 You can help us reach our high five target by adding a photo or video5 to the High 5 Wave, by 'liking', our Facebook page, sharing a video or image, nominating a friend to high five or by getting involved with activities at our High 5 Wave marquee at the Cancer Research UK Race for Life events attended by ScottishPower: Glasgow 10th May, Leeds 30th May, Nottingham 7th June, Aberdeen 14th June, London Blackheath 5th July, Manchester 12th July, Cambridge 19th July. How do I High 5? How many high fives do we need? We need as many as we can to reach our goal of 60,0005. I'm so glad I took part in this event, and although it was weird not having anyone there to cheer us along and to hug us at the finish line, having my best friend there with me to achieve this with made it special enough. 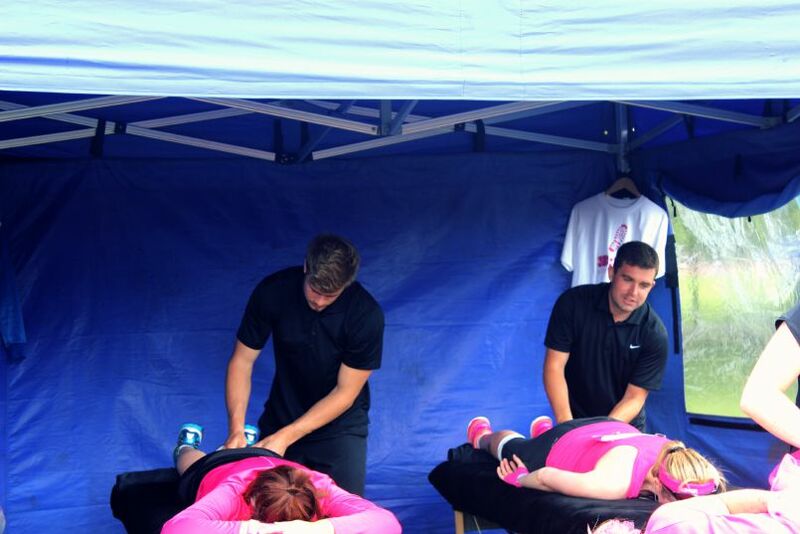 Thank you so much Scottish Power for allowing us to take part and for giving us a weekend full of happy memories.